Glasgow's Tourism and Visitor Plan to 2023 sets out a clear direction for building the city's global profile as a successful tourist destination and outlines the ambition to attract an additional one million overnight leisure tourism visits over the next seven years. One of the city's priority markets is the UK. Segmentation research has identified four key target audiences segments within the UK and this has helped to shape our market strategy, define our tactics and guide our messaging in order to reach these audiences. 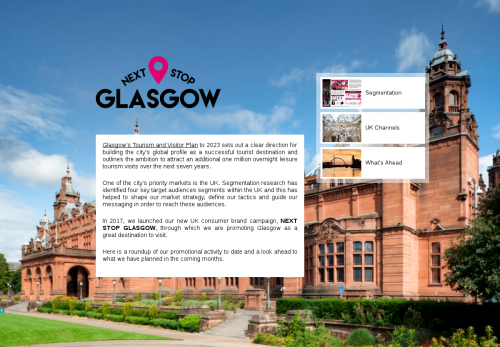 In 2017, we launched our new UK consumer brand campaign, NEXT STOP GLASGOW, through which we are promoting Glasgow as a great destination to visit. Here is a roundup of our promotional activity to date and a look ahead to what we have planned in the coming months.